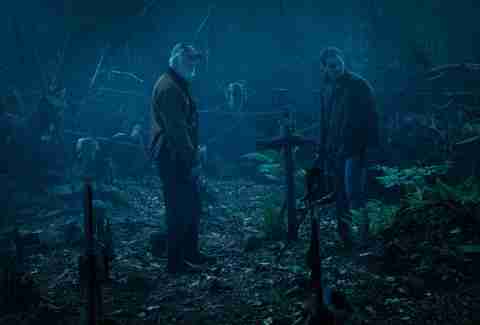 This story contains spoilers for Pet Sematary, including a discussion of the ending. 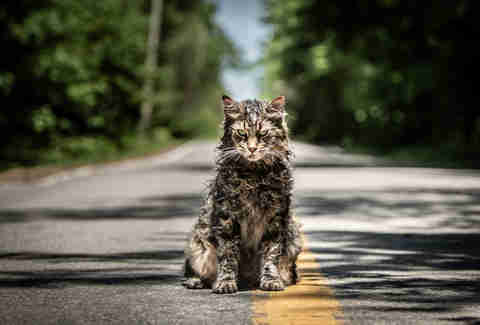 The second adaptation of Pet Sematary takes another swing at Stephen King’s classic 1983 novel, which was made into a 1989 film. Taking on a beloved author's work is always a daunting prospect, but filmmakers Kevin Kölsch and Dennis Widmyer (who previously directed the similarly character-driven horror movie Starry Eyes) keep the book’s nasty streak alive and well. The duo also manages to stay true to the spirit of King’s novel while also departing from crucial chapters, most notably in the film's shocking final minutes. 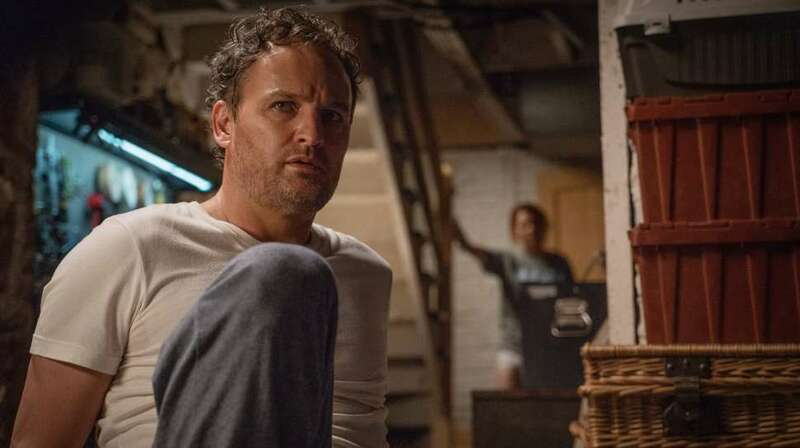 The setup remains the same as in the book and the previous film: A loving family moves out of the big city to the fictional town of Ludlow, Maine, where Dr. Louis Creed (Jason Clarke) begins his new job as head physician at the University of Maine. Louis and his wife, Rachel (Amy Seimetz), and their two young children, Gage (Hugo and Lucas Lavoie) and Ellie (Jeté Laurence), are already surrounded by death when they greet their new home. On their property sits the Pet Sematary, which -- bad news! -- is an ancient burial ground where the dead can rise again. Louis learns of its power from his neighbor, Jud Crandall (John Lithgow), a towering but sensitive grandfatherly figure who knows everything about Ludlow and ultimately does the family more harm than good. When Ellie’s cat, Church, is struck and killed by a truck, Jud and Louis bury it one stormy night, but Jud resurrects him and he returns home a changed cat. 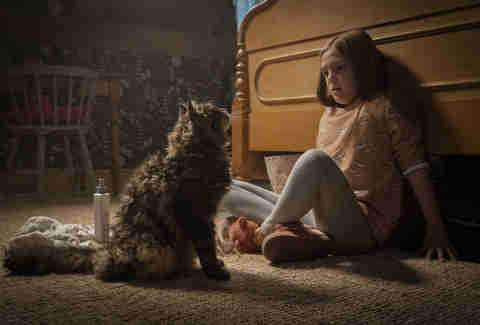 Church, named after Winston Churchill, turns from sweet to sour and is no longer the friendly neighborhood kitty, while Ellie, in a surprise departure from the book, tragically dies shortly after Church in the film's most horrifying scene. In the book, it was Gage who was killed, but the pain of a child's death stays in the story stays in tact. After her death, Jud warns Louis, “Sometimes dead is better,” but Louis -- consumed by guilt and grief -- doesn’t believe him. When Ellie’s body returns from the burial ground, she’s no longer Ellie; she'll only bring tragedy to the Creed household. Changing the antagonist from Gage to Ellie is ultimately a minor departure from the book and doesn’t alter the big picture one iota. It’s a surprise that, for better or worse, was spoiled by the marketing campaign. "When we made the movie we didn’t know if that was going to be revealed in the trailer, but it ended up being on the center of the poster," Kölsh says over the phone. "When you’re making a movie, you don’t know and can’t think of those things. You just make a movie and think people are going to be watching it blind. Knowing the book and the original movie exist, that’s something we played with. When Ellie is having the death talk, and the parents say we’re going to be around a long time, and she asks, 'And Gage? ', it’s all these teasing things about it being Gage. Any of the times we changed something, we had a little fun teasing it might go another way [than] people expected." As for King, the alteration doesn't make a lick of difference to him, so it shouldn't to any fan. Whether it's the form of Gage or Ellie returning to unleash terror, the story is still Pet Sematary. "Stephen King recently said online, 'If you’re going to Tampa, you take route this or route that, but either way, you’re getting to Tampa,'" Kölsch continues. "That was very validating, because that's what we always felt, but we hadn't heard from him. For all we know, he could’ve shown up to the movie and gone, 'It has to be the boy! They ruined the movie!' Then I would’ve been upset [Laughs]. What we were trying to do was create a new viewing experience for fans, but staying true to the essence of the material, so they still feel like they get Stephen King’s Pet Sematary." The beginning of the end is when Jud takes Louis on a foreboding nighttime stroll through the woods to bury Church, which is a rightfully iconic chapter from King's body of work. The filmmakers capture with equal intensity and grandiosity the sense of misery, fantasy, and evil forces at play in the novel. "Many Stephen King fans will attest that’s one of his best chapters, and that was sort of our pitch to the studio, that the chapter needed to be treated like a set piece, not a scene," Widmyer says. "It needs to be bigger, so we should put more money in this and really design this sequence. There's so much atmosphere and tension in that sequence. The way we approached it, everything that happens before the climb, we’d shoot in actual woods late at night. Everything shot after they go over the deadfall was shot on a soundstage. In the novel, it feels very otherworldly and mystical and this land time forgot. There’s such a mysticism to that chapter, which we really wanted to capture." The pivotal location, where the horror begins and later ends with a climactic fight scene, is dripping with atmosphere, spelling doom from the start. The filmmakers credit their crew for the splendid location, including production designer Todd Cherniawsky, known for Star Wars: The Last Jedi and Ginger Snaps. "The idea was to make it real, not like a set," Widmyer adds. "That was really built in the woods, and they gave it all of this personality. It’s not like you’re looking at a bunch of bricks and crosses. If you really study all of the grave markings, everyone is very individual and specific to the pet buried there. As an added bonus, because there are only so many names we can think of, somebody went around and asked people on the cast and crew to give a list of all their deceased pets, whether it’s a goldfish, a bird, or a lizard. We had a big list of names, and actually put those names on the grave markings as an inside reference. It’s a little love letter to our departed pets." The film's final bloody set piece unfolds at the Pet Sematary with a powerful blend of fear and emotional anguish. After Ellie stabs her mother to death, she goes after Louis. In the fight for his life, Louis is confronted with facing the loss of his child again. A major source of the horror at the end of Pet Sematary, then, is the fear every parent has: losing a child, ramped up to cinematic levels. "I think it’s easy [for a horror movie to stay emotional] when the horror is embodied in their daughter, the actress playing their daughter," Kölsch explains. "They’re not just being attacked by a monster. The creature is embodied in their daughter, so I think these actors, even during the horror, when Amy is being attacked, she’s seeing Jeté, and there’s that horror. I think the emotional connection is always there and readable on their face because it never really goes away. Like I said, it's their dead daughter. Throughout all of this, they’re faced with their worst nightmare: the death of their child. It's always present, even through all of the climatic action." Ellie’s arc from kind-hearted child to an unholy force of terror is a remarkable transformation. We’ve seen creepy kids in movies countless times, but with Ellie, the filmmakers create a horrifying one. "We were looking for someone who could play both sides of the part," Kölsch says. "We thought it’d be pretty easy to find a young girl who can do the sweet Ellie, but when it came to the dark stuff, that's tougher. We didn't want a kid who was putting on a scary voice and fall into the cliché of an evil little girl, you know? Going into it, how are we going to talk to a child about the dark subject matter and their character is going to have to do and go through? Jeté came in and was great, right off the bat, at the dark stuff. She was always in good spirits. She was just able to turn it on, this darker side, so we found we didn't have to have those discussions we were worried we were going to have from the beginning. She had this understanding of the character, more so than we did." It's a very physically demanding performance that requires its share of action. Children aren't always convincing in fight scenes, but Laurence and her stunt-double pulled it off. "If you work with child actors, you get eight hours of the 12," Widmyer says. “It’s tough. You really need a good stunt-double and body-double who looks just like the actor. The way you structure them in, you get all the scenes shot first that show Ellie’s face, and anything that’s of her back or the side, you get as much as you can with a stunt-double, especially with the action. You're basically scheduling the entire day around their schedule, which you have to do. They're kids. The good news: She was such a professional, and Jason was so helpful with all the stunts. He really helped train her and get her prepared for the physicality of that stuff. A lot of those scenes at the end of the movie, that really is Jeté, jumping on Jason’s back, the biting her hand bit, and rolling around on the ground." The fight comes shortly after Ellie kills and buries Rachel in the ancient burial ground. When Louis is about to put an end to Ellie and all the madness, an undead Rachel kills him out of frame. Once again, another nasty surprise for fans of the book, which had Louis as the one burying Rachel after she died at the hands of Gage. Since the filmmakers had no fear of departing from the source material's conclusion, they considered other endings as well. "We actually have another ending that will be on the Blu-Ray release of the film, which was the ending in the script and the ending we shot first," Widmyer says. "It’s pretty bleak. Then somebody said, 'Look, there’s gotta be a way to have our cake and eat it too, to have a very dark ending but may have one that leaves the audience on more of a high than a downer.' You’ll be happy to hear the endings in the film and in the bonus features are both fucked-up, dark endings, but the tone is slightly different. The other one was a little more bleak, which maybe people will like a lot. We love it. We’re in a good situation because we love both endings." The duo don’t want to do a disservice to the alternate ending by trying to put it into words, so we may not know what they originally had in mind for a few months. In the end of Pet Sematary, Louis, Rachel, and Ellie are one big, unhappy dead family, while Gage's fate is left unknown, frighteningly so. The boy is locked in a car, but hardly safe and facing certain doom. "In the book, it's all seen from the point-of-view of a third-party,” Widmyer says. "We knew we didn’t want to do that, but we liked the open-endedness of it. I think in the '89 movie, it’s clear Rachel kills Louis in the end, but we were always more interested in the more ambiguous ending than that, and leaving it up to the audience. Even the deleted ending, it's very ambiguous, and you take from it what you will. Even in the ending you saw, in the actual movie, you can choose to believe what you want in the end. Are they going to raise Gage? Are they going to kill Gage? What’s going to happen when they step into that house? It’s really up to you to decide, and that's the fun of it." Jack Giroux is a longtime contributor to Slash Film and Film School Rejects, and is based in Los Angeles.